Bozeman's Friends of World Language is committed to helping parents and kids in our community have greater access to World Language learning opportunities. Many of us are parents ourselves, so we know that often it is hard to justify the cost of language enrichment over other enrichment activities. But! There are definite reasons WHY it is important and good for your child. Pulling from the Middlebury Interactive Languages Program, here are just a few reminders! 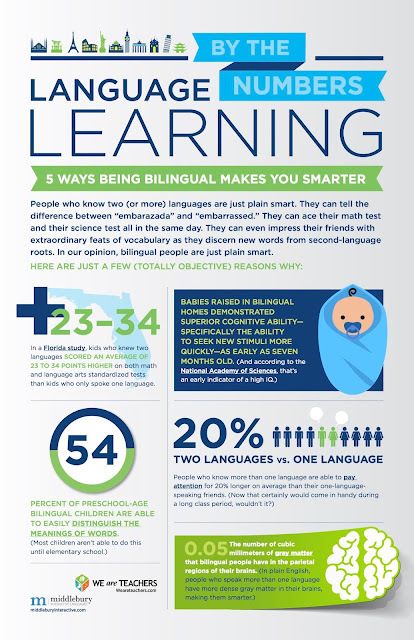 In a Florida study, kids who knew two languages scored an average of 23 to 34 points higher on both math and language arts standardized tests than kids who only spoke one language.